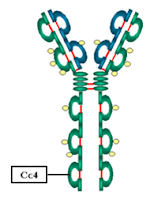 We discussed in detail the major aspects of immunoglobulin in the last post. Now let us discuss different types of immunoglobulin and how it contributes to our defence system? I think, it is better to arrange in points for better understanding. Structure: consists of two L chain and two H chain linked by di-sulphide bonds (H2L2). 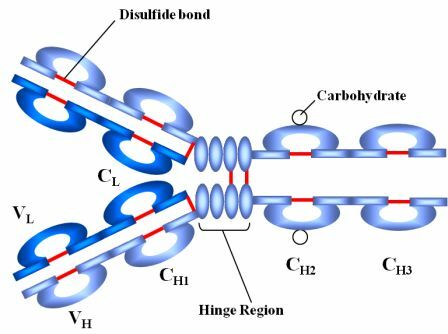 A divalent with two identical antigen binding site. IgG2 is directed against polysaccharide antigens and forms an important host defence against encapsulated bacteria. The only antibody with the ability to cross placenta. Here, Fc portion binds to the cell surface receptors of placental cells. Thus the most abundant immunoglobulin in new-borns. Promotes opsonisation or enhances phagocytosis. Phagocytes surface has receptors (ϒ-H chain ) for IgG. Consists of H2L2 units (similar to IgG) plus one molecule each of j-joining chain and secretory component. In serum, IgA exists as monomeric H2L2. The secretory component is a polypeptide synthesized by epithelial cells that assist IgA passage to the mucosal surface. It also protects IgA from degradation in the intestinal tract. Main immunoglobulin in secretions such as colostrum, saliva, tears, respiratory, intestinal and genital tract secretions. Why breast feeding is often insisted over bottle feeding? A new born baby is passively immune as the baby received antibodies from the mother’s blood before birth. During the first few weeks, baby gets majority of antibodies through mother’s milk (colostrum) which is rich in IgA. After few weeks infants own immune system start working and dependency to mother’s antibody stops there. Many results suggest that bottle fed infants are more prone to many allergic diseases later as they actually missed the IgA dose in the colostrum which contributes a lot in initiating immune response. 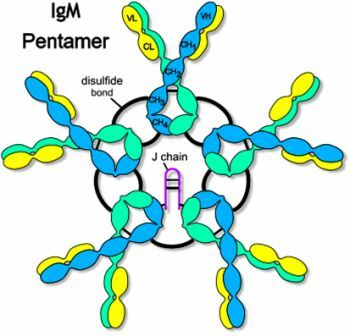 In serum, it is a pentamer composed of 5-H2L2 units + one molecule of J chain (joining chain). 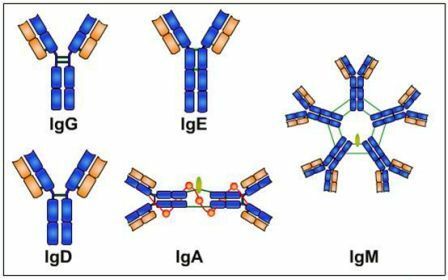 First immunoglobulin to reach the site of infection that is the major immunoglobulin produced early in the primary response. 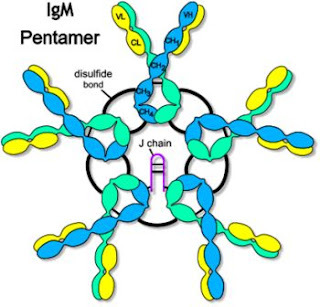 Most efficient in agglutination, complement fixation and other antibody interactions as IgM has 10 antigen binding sites. 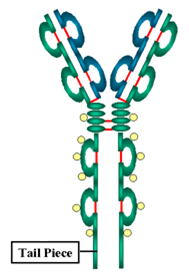 It functions (monomers) as antigen binding receptors on B cell surface. Major host defense against parasitic infection especially against Helminths (worm infection). Does not cross the placenta or fix complement.